Whether or not Congress passes health-reform legislation depends largely upon whether policymakers in Washington start listening to the American people. If they do, they could pass reasonable, targeted reforms. But that is not the track this Congress and the White House are on now. More than seven in ten Americans oppose a federal mandate that everyone must have health insurance approved by the government or pay a penalty of $750 or more per year. More than two-thirds oppose cutting benefits for seniors to pay for coverage for some of the uninsured. And 58 percent oppose raising taxes on the working and middle class to provide health insurance for more Americans. People are frightened about spending at least $1 trillion to create a new government entitlement when our nation already is awash in debt. If Congress doesn’t change course, those who support this legislation will surely pay a price the next time they face the voters. Rather than the sweeping changes Congress is contemplating, the public favors targeted reform to address the most pressing problems first. A better approach that is much more in line with the wishes of the American people would be helping the uninsured get affordable private coverage, encouraging genuine competition to get health costs under control, making health insurance portable, making sure those with pre-existing conditions can get coverage, and reforming medical malpractice. This could be part of the new Health Care Contract with America that would have much broader support from the American people. — Grace-Marie Turner is president of the Galen Institute, which promotes market-based ideas for health reform. Published in National Review Online, October 28, 2009. 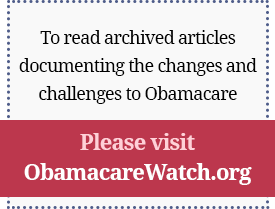 Previous Article: Can Obamacare Be Stopped? Next Article: Can Obamacare Be Stopped?